John M. Kaufman, May 31, 1812 – August 1, 1900. Regina Kaufman, February 25, 1836-January 6, 1918. Cave Hill Cemetery, Louisville, Jefferson County, Kentucky. 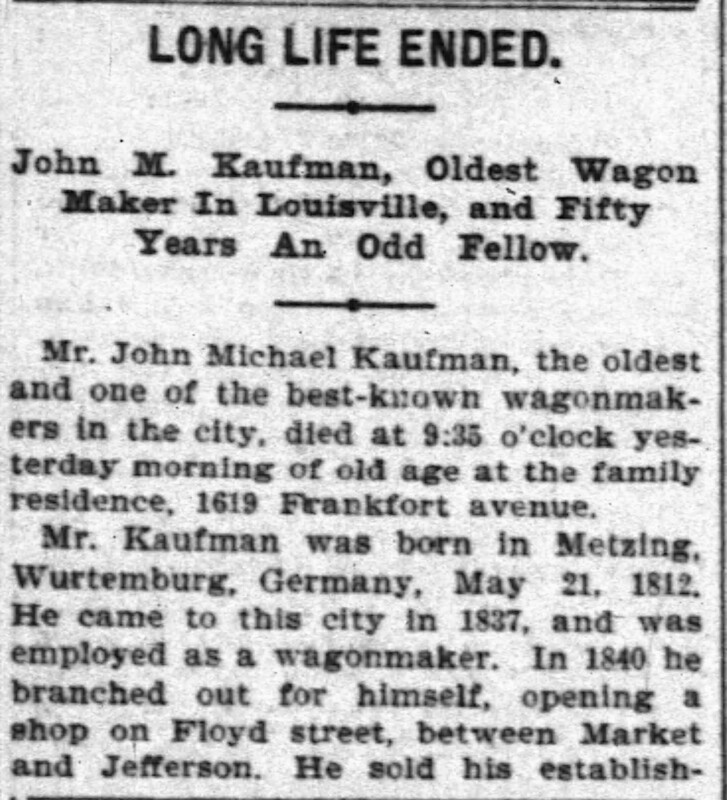 Mr. John Michael Kaufman, the oldest and one of the best-known wagonmakers in the city, died at 9:35 o’clock yesterday morning of old age at the family residence, 1619 Frankfort Avenue. ment in 1875 to Messrs. Killgore & Stilz and retired from active business. He had the unique distinction of having built the first platform spring wagon west of the Alleghany Mountains. Mr. Kaufman was married twice. In 1840 he married Miss Mary Barbara Byerly, who died in 1870, leaving four children – Mrs. Elizabeth Roth, of Jeffersonville; Mrs. Annie Knodler, Mrs. Amelia Becker and Mr. Tom J. Kaufman. On September 5, 1876, he married Miss Regina Nichols, who survives him. No children resulted from this union. 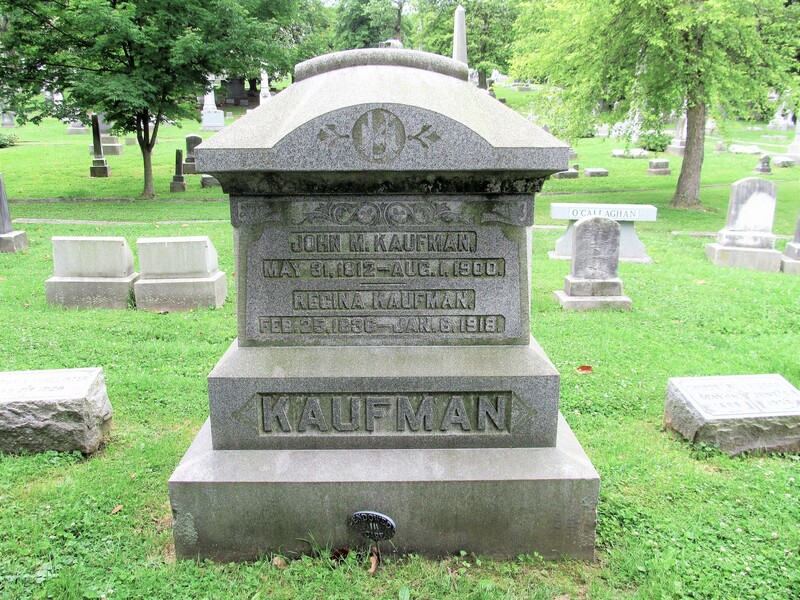 Mr. Kaufman was a prominent member of the Louisville Lodge of Odd Fellows, which he joined in 1850. The fiftieth anniversary of his membership was celebrated by the lodge in March. He was one of the founders of the German Protestant Orphan Asylum and a member of its Board of Directors. He was several times President of the board. He was a member of the German Methodist Episcopal Church at Hancock and Market Streets, having joined it in 1841, and always took an active interest in church affairs. The funeral will take place at the family residence Friday afternoon at 2 o’clock. The Rev. G. E. Hiller, of the German M. E. Church, will conduct the services, and the interment will be in Cave Hill Cemetery. The pall-bearers were chosen from among his grandchildren as follows: J. M., H. J., Fred, George and Clarence Knodler and V. F. Kaufman. The honorary pall-bearers will be chosen from members of the Louisville Lodge of Odd Fellows.